After Kapamilya actress Anne Curtis expressed her sentiments on Twitter and the official statements released by both ABS-CBN and GMA-7 related to the USTv incidents where Anne was allegedly prevented by GMA-7 staff to perform or even greeted the Thomasians during the 2011 USTv Awards Kick-off party due to schedule issue, organizers of the USTv Students’ Choice Awards finally released a statement clarifying the conflict in the performance schedules between Anne Curtis and the Kapuso stars. 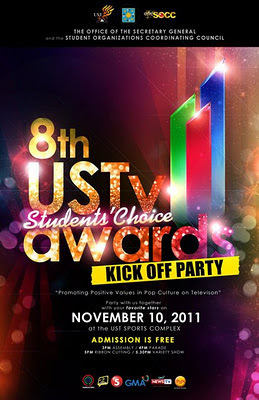 The University of Santo Tomas, together with all its students, deeply appreciate the enthusiastic participation of the television networks during the 8th USTv Students’ Choice Awards Kick Off Party held on 10 November 2011 at the Plaza Mayor of the university. We especially thank the celebrities from different television networks who generously took time out of their hectic schedules to join the Kick Off Party. The event featured a program with a pre-determined sequence aimed at giving all the celebrities in attendance ample time to meet or to perform before the Thomasian audience. Since the TV networks normally cannot declare the exact number of talents who would be able to come,last minute adjustments were inevitable, subject, however, to mutual agreement of the concerned parties. We regret any misunderstanding or confusion that may have occurred unintentionally and caused inconvenience to some. We pray and hope that all parties can move on and continue with our common commitment of promoting positive values in the mass media. After all, it is for this that the USTv Students’ Choice Awards came into being.